A. Charlois discovered asteroid #355 Gabriella. B. Jekhovsky discovered asteroid #1040 Klumpkea. Born, Edwin "Buzz" Aldrin (at Montclair, New Jersey, USA), Colonel USAF, NASA astronaut (Gemini 12, Apollo 11; nearly 12d 2h total time in spaceflight), the second person on the Moon. Buzz Aldrin, Ph.D. (20 January 1930 - ) was one of the third group of astronauts named by NASA in October 1963. On 11 November 1966, he and command pilot James Lovell were launched into space in the Gemini 12 spacecraft on a 4-day flight, which brought the Gemini program to a successful close. Aldrin established a new record for extravehicular activity (EVA), spending 5-1/2 hours outside the spacecraft. He served as Lunar Module pilot for Apollo 11, 16-24 July 1969, the first manned Lunar landing mission. Aldrin followed Neil Armstrong onto the Lunar surface on 20 July 1969, completing a 2-hour and 15 minute Lunar EVA. In July 1971, Aldrin resigned from NASA. Aldrin has logged 289 hours and 53 minutes in space, of which, 7 hours and 52 minutes were spent in EVA. 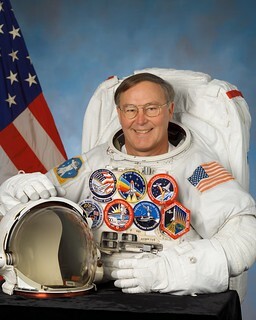 Since retiring from NASA, the Air Force, and his position as commander of the USAF Test Pilot School at Edwards Air Force Base in 1972, he has remained at the forefront of efforts to ensure a continued leading role for America in manned space exploration to advance his life-long commitment to venturing outward in space. Dr. Aldrin is President of Starcraft Enterprise, Laguna Beach, California. K. Reinmuth discovered asteroid #1163 Saga. Y. Vaisala discovered asteroids #1534 Nasi and #1929 Kollaa. L. Oterma discovered asteroids #1558 Jarnefelt andd #1559 Kustaanheimo. NASA's Jet Propulsion Laboratory (JPL) proposed a modified Apollo mission to fly around Mars and return. The proposal was declined. Goethe Link Observatory discovered asteroid #2086 Newell; and Purple Mountain Observatory discovered asteroid #3678. NASA launched A-004 to test the Apollo launch escape system. NASA launched A-004 on 20 January 1966. The basic flight objectives were demonstration of the launch escape system performance for an abort in the power-on tumbling boundary region; and demonstration of the structural integrity of launch escape system airframe structure during same period. The 6 minute 50 second flight was successful. University of Arizona astronomers reported the first optical identity of a pulsar, in the Crab Nebula. USSR launched Zond 1969A, planned as a Lunar flyby and return, which failed during launch. The USSR Zond 1969A mission, launched 20 January 1969, was intended to be similar to the Zond 5 and Zond 6 missions, consisting of a Lunar flyby and return to Earth as an unmanned test of the Lunar capsule. The craft was presumably equipped with automatic cameras. One of the SL-12/D-1-e stage 2 engines shut down 25 seconds early, causing the emergency system to abort the flight. The escape tower brought the Zond cabin down safely. M. Lovas discovered asteroid #3103. NASA's STS 32 (Columbia 9, 33rd Shuttle mission, US 64th manned space mission) landed at Edwards AFB. STS 32 was launched 9 January 1990 after being postponed to complete and verify modifications of the launch pad, and by weather. The primary objectives were deployment of the SYNCOM IV-F5 defense communications satellite, and retrieval of NASA's Long Duration Exposure Facility (LDEF). SYNCOM IV-F5 (also known as LEASAT 5) was deployed first, and used a third stage Minuteman solid perigee kick motor to propel the satellite to geosynchronous orbit. LDEF was retrieved on flight day four using the remote manipulator system. The middeck payloads were: Characterization of Neurospora Circadian Rhythms (CNCR); Protein Crystal Growth (PCG); Fluid Experiment Apparatus (FEA); American Flight Echocardiograph (AFE); Latitude/Longitude Locator (L3); Mesoscale Lightning Experiment (MLE); IMAX camera; and the Air Force Maui Optical Site (AMOS) experiment. The mission ended when Columbia landed on Runway 22, Edwards Air Force Base, California on 20 January 1990. Rollout distance: 10,096 feet. Rollout time: 62 seconds. Launch weight: 255,994 pounds. Landing weight: 228,335 pounds. Mission duration: 10 days, 21 hours, zero minutes, 36 seconds. Orbit altitude: 178 nautical miles. Orbit inclination: 28.5 degrees. Miles traveled: 4.5 million. Landing weight: 228,335 pounds. Columbia landed on revolution 172. It was the longest Space Shuttle flight to date. The orbiter was returned to KSC 26 January 1990. The STS 32 flight crew was: Daniel C. Brandenstein, Commander; James D. Wetherbee, Pilot; Bonnie J. Dunbar, Mission Specialist 1; G. David Low, Mission Specialist 2; Marsha S. Ivins, Mission Specialist 3. NASA's STS 72 (Endeavour 10, 74th Shuttle mission) returned after nearly 9 days in orbit.